Most Tacomans stop at Ruston fairly often when they travel to and from Point Defiance Park. The Antique Sandwich Company is a favorite stop. For better or worse their upstairs is mysterious and disorienting and feels like it serves as an entrance to a theater or another world. I resided in Tacoma for 10 years before I visited this place. I suppose it took so long as it was hidden from main thoroughfare and perhaps the simple name belied what was inside. Don's Market encourages one to slow down and enjoy Ruston away from the car traffic on Pearl. The place is full of Ruston historical items including paintings of Ruston and Don's Market. A mini museum. The back of Don's is a labyrinth of antique wooden walk in freezers. I don't pretend to know enough about Ruston's history to describe all the things in Don's Market, but the store holds an impressive cache. A restored historical bridge is only few dozen yards away. Don's is exactly the sort of place I fantasize going into the empty spot that Calendula Nursery used to occupy by Wright Park: A deli counter and old-fashioned soda fountain, with a small assortment of candy and other goodies and just enough indoor seating to accommodate folks on a rainy day. Some incarnation of Don's has existed in Ruston since 1906, and demand for a simple soda fountain/deli/candy store still seems to be going strong. Can Ruston and Tacoma Ever Recover? Tacoma and Ruston still suffer from the legacy of pollution from the now shuttered Asarco plant. Where the smelter once stood, a massive fenced dead zone reminds residents and visitors of Asarco's polluted past. Part of which is in Ruston and the rest in Tacoma. Driving through the area years ago was like driving through the set of Mad Max Beyond Thunderdome. The site is still nearly empty after enduring class action lawsuits, decades long multi million dollar complex EPA clean up efforts. The old Asarco site. Photo courtesy of Ruston Home. 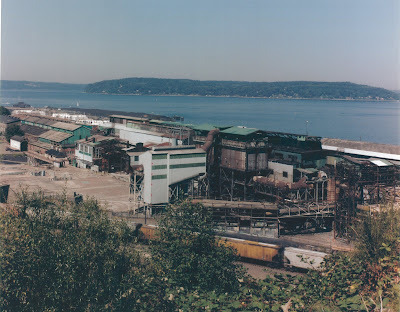 Given that nearly two decades have passed since Asarco has shut down it is easy for Tacoma and Ruston residents to become acclimated to the abandoned site. Although it has been an eyesore and the site an environmental disaster in Washington, it is psychologically familiar. Its going to take all of the concerted effort of Tacomans and the citizens of Ruston to finally "turn the page" and to be known as something more than two of the most polluted cities in Washington. As it sits now, the Asarco site reinforces the worst stereotype of the cities that no advertising consultant is going to be able to spin their way out of. The folks as Walk the Waterfront have got it right: build a continuous esplanade with public access from Point Defiance to the Museum of Glass. Walk the Waterfront is looking for individuals and groups to help in achieving our goal to improve parks, public access and walkways along Tacoma's waterfront. Envision the possibilities! Learn more about successful waterfront destinations: The San Antonio Riverwalk, Portland's Riverfront, Bellingham Waterfront Redevelopment, Tri-Cities Sacagawea Heritage Trail, Sacramento River Front,Baltimore Inner Harbor, Sydney Harbour Australia, Tallin Estonia, Miami Waterfront Walking Tour, and the Chicago Waterfront. As it sits now, the entire former Asarco site is fenced off like Tacoma and Ruston's own Area 51. Tacoma and Ruston have the potential to be more. Godspeed Ruston and Don's Market! Resolution # 37580 authorizes an amendment to the agreement with Seattle Northwest Securities Corporation to include financial advisory services for the Point Ruston Local Improvement District. Resolutions # 37578 and # 37580 are both related to the interlocal agreement with Ruston for Tacoma to help fund improvements in Ruston. The plan is to fund this project with a LID assessment and have no long term cost for Tacoma, but there is the possibility that the LID doesnâ€™t go through. Thatâ€™s where # 37580 comes in â€“ to receive financial advisement so that the treasury office can appropriately calculate the financial risks of this project and plan accordingly. There, one can get a sense of the growing and active Ruston Blogosphere. by Rue on 8/27/2008 @ 12:40pm About the upstairs of the Antique Sandwich Company: I thought there was a theater up there. Has anyone actually seen it? Is it decent? by Erik on 8/27/2008 @ 1:05pm About the upstairs of the Antique Sandwich Company: I thought there was a theater up there. Has anyone actually seen it? Is it decent? Nope. It may just be the end of the building. Yet there is a large room on the right that used to have the coolest science fiction art in it. Unfortunately, it usually closed. Then there is the Jurassic Park like garden center across the street. Beyond cool and better than anything in Tacoma. But that's another story. by jimminee on 8/28/2008 @ 10:00am RE: Antique Sandwich, it was in the early part of the twentieth century a feed store, then an A&P grocery store. The upstairs was a dance hall. When I returned to the area in the 70's it was an incredible antique store, up and down, the sandwiches relegated to a tiny corner. The back bar came from Alaska, all the tables and chairs from the Antique store. This woman was very knowledgeable and and brought in antiques from near and far. She died way to young. Her son and daughter re-opend as the Antique Sandwich Company now known near and far as a must visit for locals and tourists, especially the early morning park joggers. They did have a brief period where the upstairs was a showroom for some avant garde art but now I think it is closed off except for the bathroom at the top of the stairs.